Roasted Red Pepper Parmesan Dip is for those nights when what you need for dinner is a salad, but what you want is a giant bowl of bean dip, a bag of chips, and no regrets. Despite my penchant for creating lower-guilt versions of classic dishes, the “light” versions of certain foods cause me immediate skepticism. Chips and dip are two of these. I’d rather have a smaller portion of real-deal chips and dip and feel satisfied, than eat three times the quantity of the flimsy stuff and wonder why all I’m thinking about afterwards is French fries and brownies. 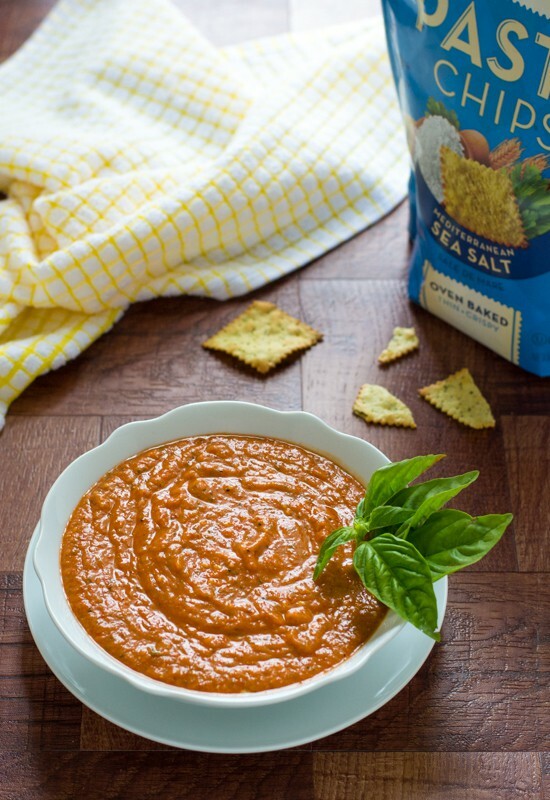 Roasted Red Pepper Parmesan Dip is a healthy dip for real dip lovers. 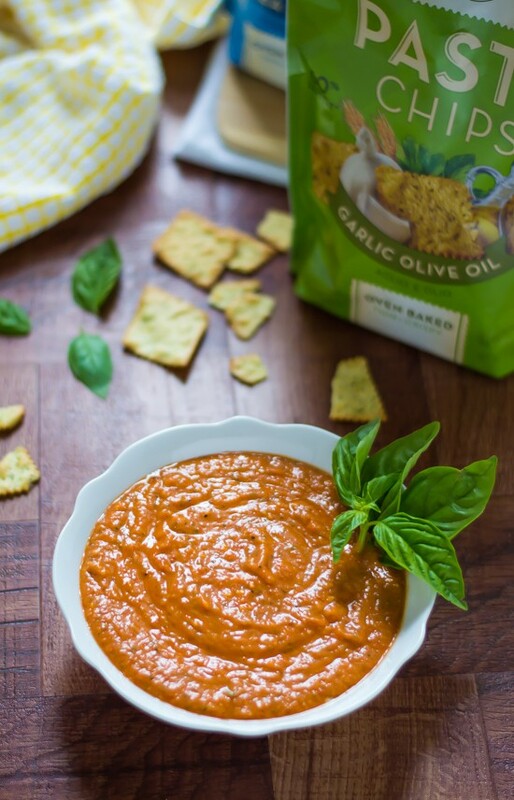 A vibrant blend of bold red peppers, fresh basil, and salty Parmesan, this dip is big on flavor and low on fat. It’s also sneaky. In place of the gobs of mayo traditionally used to give dips body, I used an unexpected ingredient: cannellini beans. Protein-rich, they make an ideal base for the Roasted Red Pepper Parmesan Dip, because they are both ultra creamy and mildly flavored. Once pureed, they give the dip structure, while allowing the flavor of the roasted red peppers, fresh basil, and Parmesan to shine. When I’m not eating Roasted Red Pepper Parmesan Dip directly with a spoon (often), my favorite way to enjoy it is with Pasta Chips. I was introduced to Pasta Chips at BlogHer Food, and I am so pumped that they have finally arrived at my local grocery store. I normally pass on baked chips, because most I’ve tried should be lumped into the same category as “cardboard.” Pasta Chips, however, are a whole different bag (did you see what I did there?). Made from semolina flour and booming with flavor, Pasta Chips are the first baked chips I’ve tried that I find totally tasty and completely satisfying. Pasta Chips have actual heft and crunch, essential for any self-respecting munch session. Other baked chips I’ve tried dissolve on my tongue and would crumble in the face of a bowl of Roasted Red Pepper Parmesan Dip. Not these babies. I was also completely impressed by their flavor. The Spicy Tomato Herb left an actual kick in my mouth, and the Alfredo tasted freakishly like…alfredo. I’m not sure what it says about how far the chip empire has digressed that I was shocked to find a chip that actually delivered on the flavor it promised, but Pasta Chips nailed every single one. To liven up my lunchbox, I’ve been packing a baggie of Pasta Chips and container of Roasted Red Pepper Parmesan Dip for the office, and I can see the same match working well for school lunches. Looking to sneak veggies and protein into your kids’ diets? Disguise them as Roasted Red Pepper Parmesan Dip, with a side of Pasta Chips for dipping. It worked brilliantly on Ben, who is still the biggest kid I know. Dip for dinner? 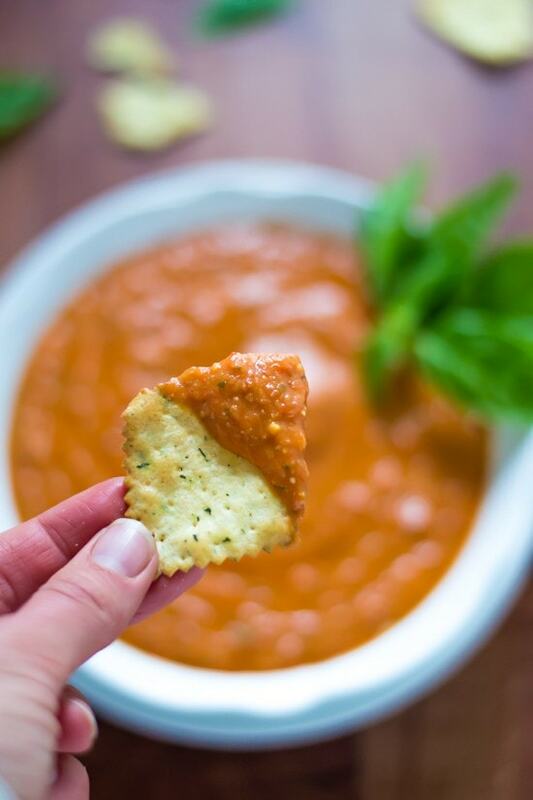 Roasted Red Pepper Parmesan Dip says yes. Yield: 2 1/2 cups, approx. A 5 minute dip that is packed with flavor! 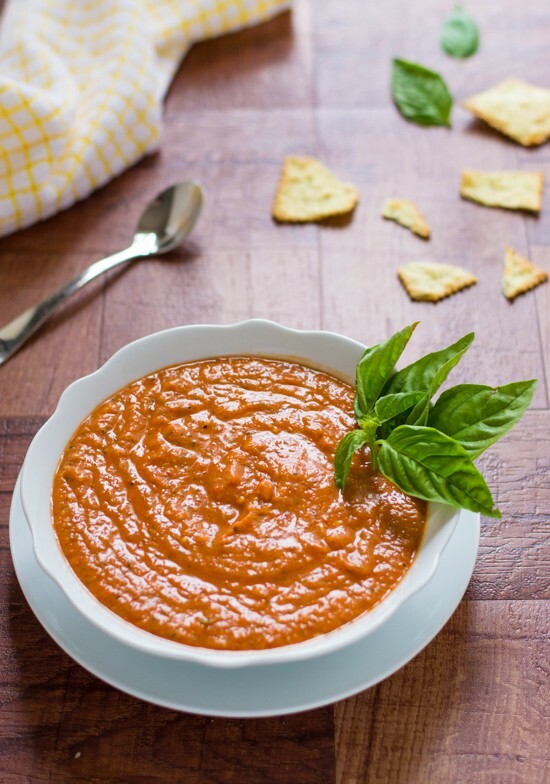 This roasted red pepper dip is vibrant, healthy and a always hit at parties. Gently pat the rinsed beans and red peppers dry to remove excess moisture. In the bowl of a food processor fitted with a steel blade, place the beans, red peppers, basil, Parmesan, lemon juice, garlic, salt, and pepper. Blend until pureed and smooth. With the machine running, drizzle in the olive oil. Serve with Pasta Chips and veggies. Pasta Chips compensated me for my time to create this recipe and post. As always, all opinions are my own. Thanks for supporting the brands who make this blog possible. You know how I feel about low-fat, light cheese! This dip looks awesome! I made the Roasted Red Pepper Pasta from Minimalist Baker earlier this week and now I am obsessed with all things roasted red pepper. Perfect timing! I have those kind of nights every night! I triple love dips. Pinned. I’m ALL about dips – low fat, full fat, mostly cheese: I’ll take `em all, thanks. But I especially can’t resist red pepper dips. They let me claim I’m eating vegetables while really just fulfilling my never-ending hunger for dippy deliciousness. I LOVE roasted red peppers…fabulous dip! Love the idea of using beans in this dip!! I want to try this and not tell my husband about the beans and see what he says. He says he doesn’t like beans but I bet he would never know!!! I love how sneaky you are! And you seriously cannot taste the beans at all. It’s all roasted red pepper and Parm goodness! I love using cannellini beans in dips! This one is a total winner – I love roasted red peppers, and all those Italian flavorings are perfection. I’ve never heard of Pasta Chips before but I should check them out! They sound great. This has tailgating written all over it! Lord knows most people’s version of tailgating food could be amped up a bit, and this sounds delicious! Erin, oh my gawd, I love this dip! and LOVE Pasta Chips. . since BlogHer Food, I’ve been picking up bags at the grocery store .. love them. And you can bet this dip will be making an appearance for us on family movie nights (when we indulge in everything cheesy and dippy). Arghhh this is too good!!! I love roasted red peppers and usually make a sauce but this dip is just going to be dangerous! Now I want to find pasta chips! They look great. The dip looks better! Love the protein punch! I’m the same way about light dips and chips-NOT worth it! But this looks delicious! I wonder how greek yogurt would fair in a homemade dip instead of mayo? Julia, I swap Greek yogurt for mayo in A TON of dips. You can use up to half, and it’s totally undetectable, though I usually swap almost 100% because I have a mayo version that dates from childhood. I say play around and find the right balance for you! I’m doing a happy food dance over here for this yummy dip! And those chips… I need to get my mitts on ’em. This looks like my kind of dip and chips! Greatest dip ever, this sounds so good!!! Love roasted red peppers and love any and all dips! This looks awesome! I could make a lunch out of this! Love roasted red peppers! Definitely wouldn’t miss the full-fat chips and dip here! Yum!! This is one good looking dip! And I’m the same way – normally I’d rather eat less of full-fat etc. but this looks too good to pass up! Gosh, I TOTALLY want just a bowlful of this dip and bag of chips for my dinner tonight. I adore roasted red pepper-anything! Pass the chips please. Love the vibrant color and the creamy texture of this dip! Oooh, this dip looks so so good! I love roasted red peppers and adding bean in here is such a fab idea! And those pasta chips sound awesome! Thank you so much Kelly! I am such a roasted red pepper lover too. Thank you Erin for the nice dip. I love them too Ashley! If you are a fan of roasted red peppers, you would definitely enjoy this dip. Yes to chips and dip for dinner!! I’ll have to try those pasta chips soon. I’m always up for chips for dinner!! Want. No, I take that back. Need. This is my kind of dip — fresh, flavorful, and packed with hidden protein?! It just doesn’t get any better than that. And I have never even heard of these magical pasta chips you speak of, so I am totally going to be keeping my eye out the next time I go to the store. They sound perfect! Gorgeous! I love chips and dips (and like you, I’d rather have quality over quantity!) This roasted red pepper dip is a major winner. Thank you for sharing it! This dip looks phenomenal. Yes, I really do mean that! The Mr. is VERY into dips so I’ve got to show him this to whip up! I’ve got a jar of roasted red peppers in the pantry right now. Pinning this! What! Yum. This is the perfect dip for late summer / early fall, and oh so elegant. Pinning! I’m having people over for some cheese & wine tonight, wonder if this dip will go well? Think it might!! This looks delicious! I love the idea of using beans to lighten up a dip (and this will let me sneak beans into my bean-hating boyfriend’s diet, heheh) I’ll be on the lookout for those pasta chips too! The man doesn’t like beans??? Oh my, I don’t know what we would eat if Ben didn’t like beans, LOL. I fully support your sneaky ways! YUM! I am with you on eating smaller portions of the real deal; no point in trying a “diet” version, since I know it won’t be nearly as good, right? This dip looks delish! I love peppers raw myself, but the roasting is MAGIC! It makes them so sweet and wonderful, they are practically their own food. Thanks so much Anna! Hi, Erin! This really reminds me of a popular dip in Greece with paprika and feta, but it looks exactly like this. This is definitely healthier, though. I love the cannelini bean trick! I LOVE that dip Helen! Now you have me wanting to try a version of this with feta. Yum! We made this red pepper dip this week and really loved it! Loaded with flavor, so healthy, and filling. We enjoyed it not only as a dip but with other combinations too. It’s so good spread on a toasted baguette topped with tuna (I’d recommend tuna packed in olive oil if possible). It’s also great as a side dish to a salad, like you would do with hummus. It’s also good as a topping to grilled asparagus, and also on Spanish tortilla (omelet with potatoes). (Delicious by the spoonful as well…!) Definitely will be making this one again! Thanks Erin for sharing another great recipe! Hi Ana! I’m so so excited that you enjoyed this dip. Great idea on the tuna and other uses too. You are making me hungry :) Thanks so much for letting me know you tried it and sharing your thoughts. It always makes my day! This recipe is delicious and I must stop snacking on it or my guests won’t get any, lol! What temperature is this served at? Can it be made ahead of time and refrigerated? Hi Nicole! I would serve it cold or at room temperature, and you are fine to make it a day ahead. Hope you enjoy! Just made this to take to a party. Delicious and so quick to make! Hooray! I’m so happy to hear that Pam. Thanks for trying the recipe and letting me know! This was delicious but I have a lot left over after my first serving. How long would you suggest storing it in the fridge for? Hi Katie! I think if you cover it tightly, it should be fine for a few days. We used some of the leftovers as a sandwich spread, and it was d-lish. I’m glad you enjoyed the recipe! I just made this dip to go with some veggies. It is absolutely delicious. I would not change a thing. It is great for my weight watchers diet. Pat, I’m so glad the dip turned out to be a winner for you! Thanks for taking the time to leave this great review! I served this with carrots and potato crackers last night, and it got a thumbs-up from everyone. Today I put some of the leftover dip on a sweet potato for lunch. It was fantastic! Jill, thanks for giving the recipe a try and taking the time to leave this review too!